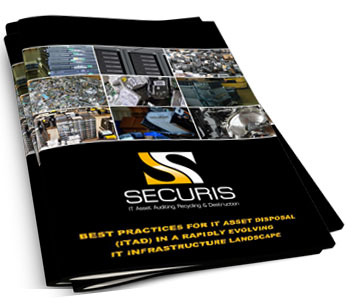 Securis has developed a meticulous and secure end-to-end process that brings together technology, people, processes and infrastructure to ensure the highest levels of quality throughout the entire chain of custody of our clients’ IT assets and electronics. You are always in the loop for every asset during certified data destruction and your e-waste logistics. All electronic data is rendered irretrievable by Securis’ trained staff, using data destruction methods that are in complete compliance with NSA and DOD standards, HIPAA, FACTA, Gramm-Leach-Bliley and various other state and federal compliance measures. Processes include and . Corporate identifying information is removed from all electronics. Processing also include some data anonymization to prevent linkage of audit reports to specific hard drives being destroyed. Materials are shredded using one of Securis’ industrial hard drive shredders. Securis’ facilities are subject to constant intrusion monitoring and protection to insure the security of each client’s electronic assets and information. Your e-waste logistics and tracking is easy to understand and thorough for all of your assets. As your certified data destruction partner, Securis promises that you’ll have a full understanding of how your data is processed and where it lives during each step of the e-waste recycling process. We operate secure facilities and can even perform secure processing on your job site, giving you the opportunity to have staff oversee the initial destruction. We want you to feel safe and secure with your data destruction and electronic waste processing, so we invite any and all questions. Use the form on this page to get your answers and even receive a free, no-obligation quote for your data destruction needs.